"The play they are not allowed to talk about. 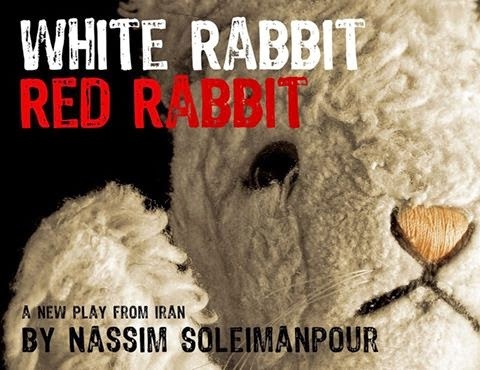 Iranian playwright Nassim Soleimanpour was denied a passport because his status as conscientious objector. Unable to travel, he wrote a play which, since its premier in 2011, has taken audiences by storm and been celebrated worldwide as one of the most transformative and original evenings in theatre. Every performance is unique - and a surprise for the brave actor who is not allowed to see the script until the moment they arrive on stage, joining the audience on a journey into the unknown; stumbling upon the personal and profound, the limits of liberty and ultimately where theatre can take you, with or without a passport." Now you know as much as I do about the play that I'm performing on Monday. No, really. The Kansas City Fringe Festival is producing this run, with a different actor every night. Why? Because the playwright, for what I'm sure is a very good reason, doesn't want the actor to see the script until it is handed to them, onstage, in front of their audience. No, I don't get any time to look it over before I start acting. Zero minutes. Yeah. 'S craziness. I know. I've talked to a few of the other people slated to perform this piece, and they seem quite casual about it. Sort of a "No rehearsal? No problem!" kind of thing. I guess part of me feels that way, but it goes against my natural tendencies. I've always been one, when faced with a challenge, to research the heck out of it. It's akin to knowing your enemy, I guess. Google is my best friend. But for this play? No. No research! Bad Tara! And now, I'm scared that I'll accidentally learn something I'm not supposed to know, by some well-meaning audience member letting details slip. For instance: Here's KC Fringe's Director of Development, Brent Kimmi, discussing the project on Kansas City Live. My name might be mentioned once. Or twice. (The selection they perform is not from "White Rabbit Red Rabbit." It's from our 2012 play, "Sexing Hitler." Obviously, since it's on daytime network television, it's not as racy as it sounds.) But Brent uses the word "interaction," and now I feel like I know too much. Then suddenly, last night, a thought: What if there's more than one script, and an audience doesn't know which script they'll see performed until they show up? I mean, how would I know? How would the audience know? An audience member could see it two or three times, and just always see the same script performed, luck of the draw? Then I could get up in front of the audience on Monday, get handed the script, and just say anything at all. The audience would pretty much HAVE to believe me! I could recite pieces of audition monologues I've done over the years, or describe my breakfast in great detail, or confess deep secrets, or relate stories about students, or anything! AND I wouldn't have to wear reading glasses! ...oh. Well. There you go. If I'm not wearing reading glasses, it's a pretty good bet that I'm making it up. Now you know my secret. It has not escaped me that this theatre experiment is something of an analogy for life. You never know what's coming, you can never fully prepare. You show up, and deal with the script that you're handed. I mean, I teach improv, for crying out loud. I know about jumping in. I know about saying "yes." I know about not knowing. So how is this project different? It's... not, I suppose. Hm. If you're interested in seeing this fascinating experiment, here's the link to the Facebook event page, where you can read some of the fretful thoughts and conversations, and here's the link to purchase tickets. If you're interested in the possibility of seeing me fall flat on my face... well, the same links will work.